Import leads from ReachEdge and keep them synchronized with your Kickserv contact list. Under Add-Ons in the side menu, click ReachLocal. You will be taken to a ReachEdge sign-in screen. Enter the email address you use to login to ReachEdge and your ReachEdge password. Click Sign In. Once you have read the Terms and Conditions on the following page, check the box marked "I agree" and then click Continue. You will be returned the the ReachEdge Sync connection page and should see the "You are connected to ReachEdge" message. Click the "Sync contacts with ReachEdge" button. You will be taken to the main Contacts page and should see a message letting you know that your contacts have been queued for importing. The sync process may take a few moments to complete. Check your email for a message letting you know that the contact import has been processed. If there were any errors during the import, the email will include a link to a page where you can view them. You can now view your imported contacts in the Contacts list. 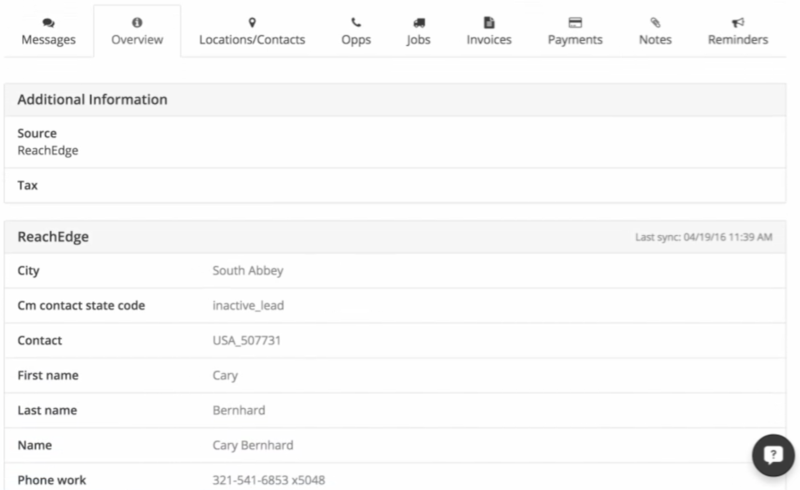 Click the contact's Overview tab to view ReachEdge-specific information such as the contact's ReachEdge ID. Imported contacts will have "ReachEdge" as the source.